While rooting around trying to find more on the Dr. Lee-O-Netto ladies, I came upon this wonderful little treasure. The death of Mrs. Caroline Augusta Horton, wife of F. N. Horton, occurred at her home in Spring Street, East Randolph, Sunday evening at 7 o’clock, aged 74 years. Mrs. Horton has been in failing health for some time and a heart difficulty was given as cause of death. Mr. and Mrs. Horton had been residents of Sample Hill for a number of years, occupying the old Van Ranselaer farm, until last fall when they purchased their home in East Randolph. 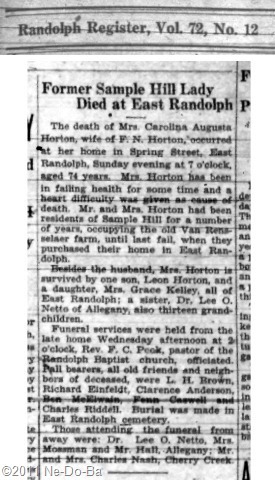 Besides the husband, Mrs. Horton is survived by one son, Leon Horton, and a daughter, Mrs. Grace Kelley, all of East Randolph; a sister, Dr. Lee O. Netto of Allegany, also thirteen grandchildren. Funeral services were held from the late home Wednesday afternoon at 2 o’clock, Rev. F.. Peck, pastor of the Randolph Baptist Church, officiated. Pall bearers, all old friends and neighbors of deceased, were L.H.Brown, Richard Einfeldt, Clarence Anderson, Ben McElwain, Fenn Caswell and Charles Riddell. Burial was made in East Randolph cemetery. Those attending the funeral from away were; Dr. Lee O. Netto, Mrs. Mossman and Mr. Hall, Allegany; Mr. and Mrs. Charles Nash, Cherry Creek. As a researcher, I just love finding these little family treasures. So simple yet chock full of data waiting to be mined. Of course of greatest interest is the name of her sister and her husband. This appeared in the July 10th edition of the newspaper. Using the nifty little calendar tool of my RootsMagic genealogy software, I discovered the 10th was a Friday. This states she died Sunday, so it appears her death date would be the previous Sunday or the 5th of July, 1931. The funeral was on Wednesday, which would be the 8th of July. Using her age and the statement about her sister being Dr. Lee O. Netto suggests this is the child “Carrie” in the 1875 NY State Census with Layton & Marleah Kanistanaux. It also shows beyond a doubt that Carrie is not the woman known as Dr. Lee O. Netto. I can now show with reasonable certainty that Carrie, Henry/Isaac, and Dr. Lee are siblings. But where does William, the youngest of the 1875 household, fit in the picture. Is he still alive? Is he a half or step sibling? A nice puzzle to work on at some point in the future. The death record of Henry/Isaac Kanistanaux did not mention this sister, yet she was obviously still alive. Perhaps they did not stay in touch with each other, so the informant (probably his wife) did not know about her or perhaps it was just an oversight. What is clear is that this Dr. Lee did stay in touch with both of her siblings. This obituary provides me with information about Carrie’s current residence, her prior residence, her husband’s name and the names of her surviving children – lots of research suggested there! For now I will just try to find her in census records. Now I know where to look and what her married name is, so it should be easy. Since this family appears to have owned land in two communities (Randolph & probably Sample Hill), a search of land records may turn up something useful. If I had lots of time and a need, I could track down all the pall bearers and others mentioned to see if they are related. At this time I don’t think is necessary for my project, but it would be a good idea for descendants to look into the friends & neighbors.